Three years ago, I set my alarm for the wee small hours of the morning and headed out under the stars. Nothing unusual there, you might think if you’re a regular following of my nocturnal work. But what was unusual was what I was photographing. The Moon. Being gobbled up before my very eyes. And turning a deep and disturbing blood red. Had I got wind of some ‘end of days’ event, some ancient prophecy that was being fulfilled before my very eyes? Well, no, although I could totally see how some ancients might have felt that way, witnessing what I was seeing, without knowing what exactly was going on. Of course, what I was seeing was a lunar eclipse, something that has a perfectly reasonable scientific explanation. However, to witness the sky go dark, the Moon go red and the stars to come out with the same kind of brightness and vibrancy they show on a dark, Moonless night was still something breathtaking, even as it was sleep depriving. And, this Friday, you too could witness your very own end of days event, as the Moon once again becomes eclipsed by the Earth - and all visible from Ireland! The eclipse occurs as the Moon passes into the shadow of the Earth. We will not see the full sequence of this eclipse from the UK and Ireland as, by the time the Moon rises, it will already be blood red and in totality. 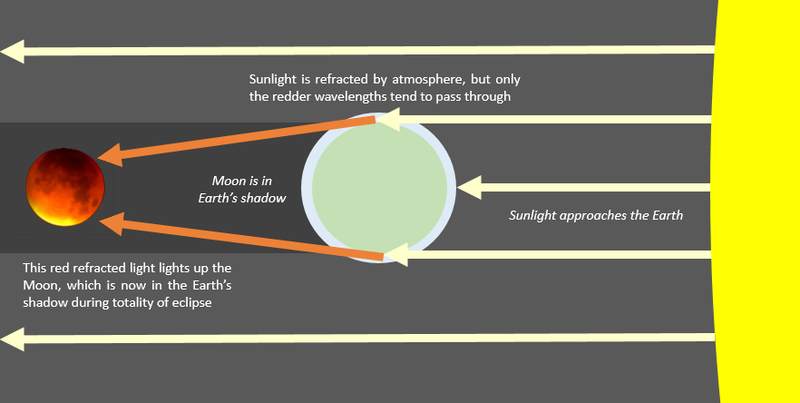 But, if we were able to see the entire show, the first thing you would see is a slight darkening of the Moon as it heads into the penumbra shadow of the Earth (see below diagram). 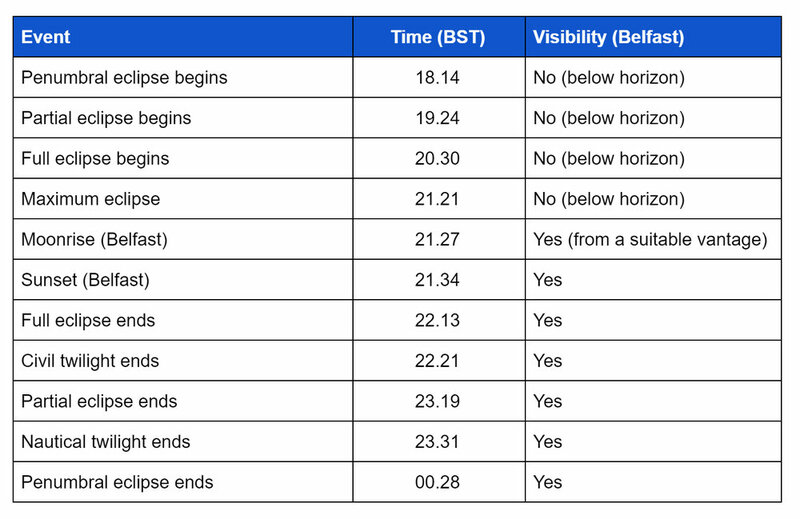 In the UK and Ireland, we will not see this stage this time as the Moon will have entered the penumbra over 3 hours before it rises over our horizon. Then, as the Moon edges into the full shadow of the Earth (known as the umbra) you would begin to see a 'bite' being being taken out of the Moon, as the shadow of the Earth covers an increasing amount of our satellite. Again, this will have happened before Moon rise with us on Friday night, so we will not see it. Finally, the Moon passes entirely into the umbra and is not being lit any more directly by the Sun. It’s at this stage that you might think the Moon will disappear. In fact, it doesn’t. To the ancients, having watched the Moon being gobbled up, it might seem like the next stage is some form of grizzly aftermath of a celestial conflict, as the Moon turned blood red before their very eyes. Again, the Moon will enter the umbra before it rises over our horizon. You will see that the time scales we have to capture totally are limited (only around 45 minutes of totality from Moonrise), and they coincide with twilight after sunset, so the sky will not be at its darkest. Be in position for sunset if you want to maximise your chances of witnessing this event! From then, there's about another hour where the shadow of the Earth gradually withdraws from the Moon. In the past phase - the penumbral eclipse - the Moon has no distinct 'bite' of a shadow out of it; it is merely slightly darker than the non-eclipsed Moon. The Moon is rising to the south east (at 124 degrees) and moving more towards the south as it rises further into the night sky. Those with a keen eye for the night sky will have noticed just how bright Mars is at present. This is due to a combination of a few factors - the Earth is orbiting between the Sun and Mars at the moment, so we are seeing the full disk. Also, we are particularly close in our approach to each other, so the distance between the two planets is at its least. Also, over the past few weeks, there has been a massive dust storm on the Red Planet, making it reflect more sunlight and helping it shine that bit brighter. The Blood Moon will pass close to Mars on Friday night. So, if you have clear skies, you can expect to see the the Blood Moon pass close to the Red Planet in a glorious celestial conjucntion! The Moon will rise already in totality. At this stage, as we have discovered, the Moon is only lit indirectly, so it will dim noticeably. Keep your shutter speeds quite low (otherwise the Moon will move in your shot), but open up the aperture more and increase the ISO to get a good exposure. The light will not have the same clarity at this stage, and it will be harder to get a clean, crisp shot. In my experience of photographing the last eclipse in 2015, I struggled to get a clear image of the Moon in totality. An added challenge this time will be the fact that the Moon in totality will be low in the atmosphere, always something that reduces clarity in astro photography projects. Also, it will not be totally dark during totality, so that again will be challenging to us photographers. The total eclipse will end around 10.15 and after that the Moon will go into partial eclipse and then the penumbral eclipse. The Moon gradually becomes much brighter at these stages, so go for a short shutter speed of a second or less and an f stop of at least 5.6 or higher (to keep your image sharper). Keep your ISO low. As the Moon rises further, we will be battling with less atmospheric interference, so it will be much easier to get images of good clarity. Happy hunting if you're out on Friday night - and let's start praying for clear skies...!